Fantastic Burger Joint with Drive-thru and Patio priced to sell quick! ABOUT THE BUSINESS: This is a rare opportunity to acquire a fantastic Burger Joint at a fraction of the cost to replicate, located on the main drag in historic Boulder City that is a favorite among tourists and locals alike. Offering homemade burgers, frys, dogs, shakes and malts in an idyllic setting including a drive thru and an outdoor patio area perfect for those warm summer nights with the kiddos! New owners will step into a profitable business from day one with an opportunity for significant upside. 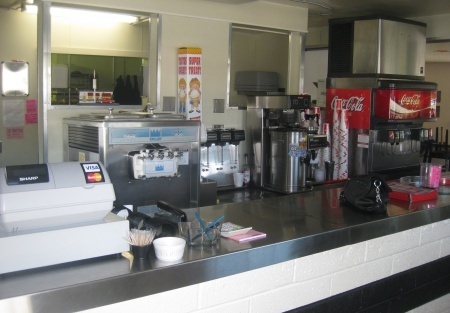 THE EQUIPMENT: There is extensive equipment in this sale, which includes walk-in cooler, reach-in freezer, Sandwich Prep Bane, Two flat tops, Two fryers, Up Front Coolers and much more. All equipment is in use to support current operations and included in the sale. LEASE: Situated on .34 acre, the 1300 SF building and land are leased for $2500 per month, NNN. No Cams. Opportunity exists to negotiate a new lease. REASON FOR SELLING: The owners are accomplished business people ready for their next challenge. ABOUT THE AREA: Boulder City is known as a clean, quiet, green oasis in the desert. Located approximately 20 miles from Las Vegas, and just a few miles from the Lake Mead National Recreational Area, and the Hoover Dam boasting a population of slightly more than 15,000 people. Boulder City is a small historic town with low crime rates, a good school system, and sustainable small businesses to maintain a lifestyle not available in the big city . In addition, it is expected that the new bypass bridge, that recently opened at Hoover Dam, should reward Boulder City with an increase in tourism and added income to the local businesses. UPSIDE OPPORTUNITY: By increasing the hours of operation and offering a breakfast menu, this restaurant has the opportunity for significant growth. In addition, this restaurant has the rights to expand within a new development project offered by the City. GET THE NAME AND ADDRESS: This is an ideal choice for being in business on day one. Grab this opportunity quick. Select the orange button titled want name and address and you’re on your way to seeing this business. Price Reduction for a Quick Sale!